Your mother was right when she insisted on you eating your salad! Cucumbers contain most of your daily vitamins requirements. B1, B2, B3, B5 and B6. Are you feeling tired and exhausted during the afternoon hours? Forget about too many caffeine drinks and switch to Cucumber. 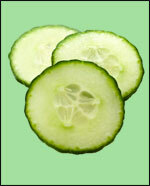 Cucumber is an excellent source for vitamin B and carbohydrates. It will revive you and keep you alert for hours. Is the bath mirror fogging? Did you hang-out the towel trying to fight it? Don't give up yet! Try and rub a slice of cucumber over the mirror surface. It should prevent the fogging and also relax you due to its unique aroma. Are there snails,slags and other crawlies in your garden? Slice a cucumber and place the slices over an aluminum cooking tray. The reaction between the chemicals in the cucumber to the Aluminum generates a nasty smell that drives these crawlies madwhile humans can not sense it. Are you looking for a temporary fix for your cellulites and wrinkles? 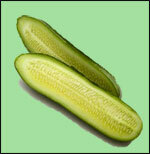 Rub one or two cucumber slices over the problematic area for a few minutes. The phytochemicals (chemical compounds that occur naturally in plants) in the cucumber are causing the natural collagen in the skin to contract. These phytochemicals will also sooth and soften your skin. Are you battling with hangover often? After a wild night while drinking too much alcohol, eat a few slices of cucumber before going to bed. You will feel the difference when you wakeup the next morning with no headache. The sugar, B vitamins and electrolytes in the cucumber are enough to renew the supply of critical nutrients that the body lost. Do you want to stop this habit of snacks between meals and especially at night? 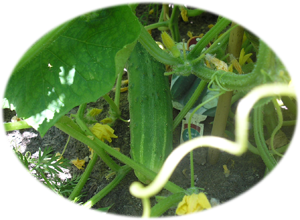 During recorded history (distant and recent) cucumbers were used by hunters, travelers and traders as a quick snack to suppress their hunger. You can try it too. You have nothing to loose except weight. Did you forget to brush your shoes or you are out of shoe polish? Rub a slice of cucumber over the shoes. The chemical in the cucumber bring out the shine and also make it water resistant. Do the door hinges squeak and you are out of WD40 (lubricant spray)? Rub a slice of cucumber over the hinge and the squeak will disappear. Cucumber can relax you when you have no time for a spa or a massage? Simmer a sliced cucumber in boiled water. The aroma coming from the steam will relax you. Are you suffering from bad breath after a business meal or any other time? Take a slice of cucumber and press it with your tongue against the roof of your mouth for 30 seconds. The phytochemicals will terminate the bacteria that cause bad smell. The literally Green way to clean your stainless steel products (sinks, taps, pots and more)? Rub a slice of cucumber over the surface you want to clean. The process should remove years of collected residue and will make it shine without leaving any marks or damage to your fingers and nails. Do you need to erase pen writing? Used the external skin of a cucumber and gently rub on the area you need to erase. Same will work on markers (and more) that the kids used to decorate the wall. Peel a cucumber. Take out the seeds by slicing the cucumber over its length to two halves and with a small tea spoon take out the seeds from each of the halves. Slice the cucumber halves. Add few 3 to 5 mint leaves to the cucumber and mash the mix. Beat an egg white and then add it to the cucumber mixture. Apply this paste to your face or other area for twenty to thirty minutes. Rinse it with water and pat it dry.